Samsung made a couple of announcements at their CES 2018 press conference. 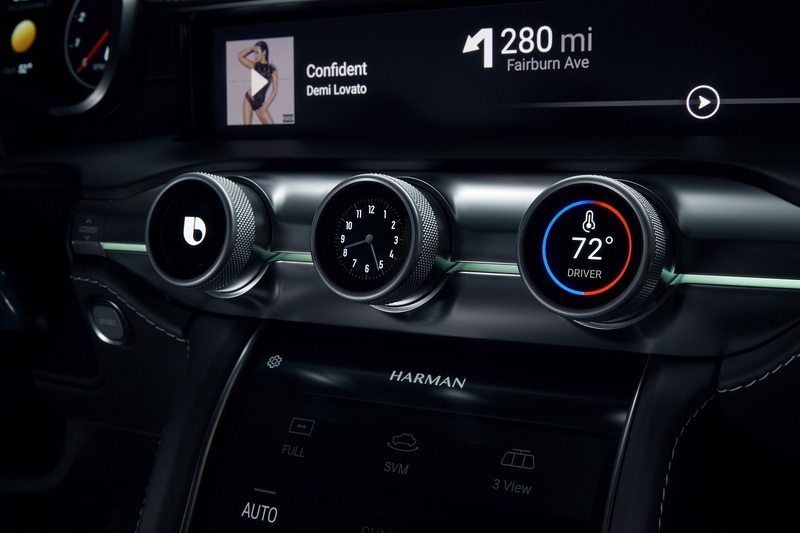 Samsung and Harman International (which is a wholly owned subsidiary of Samsung) showed off what they believe to be the future of connectivity and autonomous driving. The first part is the Harman Digital Cockpit Platform which is a host of flexible and scalable premium experiences”. There will be standard and advanced configurations and the instrument cluster can be seamlessly integrated with the vehicle’s center console using a combination of voice, haptic feedback and physical knobs and steering wheels controls. All of this is displayed in a single, center screen with all vital vehicle information. The Digital Cockpit allows the driver to focus on the road ahead while also being able to stay connected with their in-car technology. Most of this is done through connecting a user’s smartphone. The premium configuration of the Digital Cockpit has a multi-display layout which used Harman’s Ignite Platform and the in-car experience can be customized via services such as voice assistants, augmented reality and more. This configuration is running on Android. Samsung and Harman say that the Digital Cockpit can be configured for every vehicle type. In addition, the two companies are also working on 5G-ready automotive solutions for speeds of up to 1 Gb/s and also providing high-res streaming, virtual and augmented reality experiences and seamless cloud-based applications. Samsung and Harman also announced the DRVLINE platform, which is an open and modular platform that’s made for autonomous driving which can be scaled from Level 3 automation (which means that the vehicle can manage most aspects of driving such as monitoring the environment) to up to Level 4 (which is where a vehicle can operate without any human input or oversight) and Level 5 (which is when a driverless car can operate on any road with any conditions that a human driver specifies). Samsung has announced their plans for Internet of Things (IoT) experiences in the coming years. First, they plan to make all their products IoT ready by 2020. Samsung will also be making a point to make IoT adoption an open, consistent and intelligent platform. They’ll be working with partners such as the Open Connectivity Foundation (OCF) to help create common industry standards. This spring, Samsung will consolidate all of their IoT apps, such as Samsung Connect, Smart Home and Smart View into the SmartThings app, so then it’ll be a more uniformed experience. Samsung will be connecting the Harman Ignite platform to the SmartThings cloud in the near future. Samsung is also adding Bixby to select smart TVs in addition to their new Family Hub fridges. They’ll also be adding their Knox technology for added security to all their connected devices. 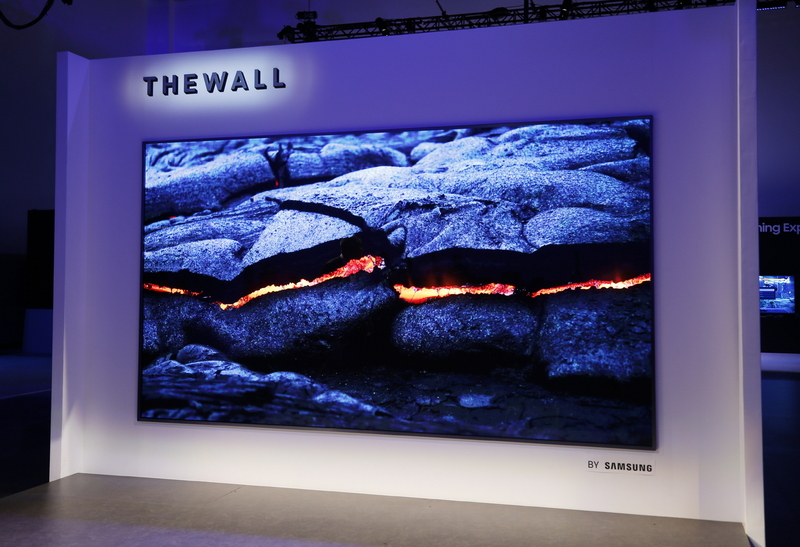 Samsung also showed off “the world’s first modular MicroLED 146-inch TV.” It has a bezel-less design and a modular-base structure which can be customized depending on the home. The MicroLED technology in the The Wall means that the TV doesn’t need colour filters or a backlight, the TV is its own light source. In addition, Samsung also announced a QLED TV with their 8K AI technology. The technology will upscale standard definition content to 8K and a proprietary algorithm will adjust the screen resolution based on the picture quality characteristics of each scene. The QLED TV with 8K AI Technology will be available in the US and Korea in the second half of 2018. 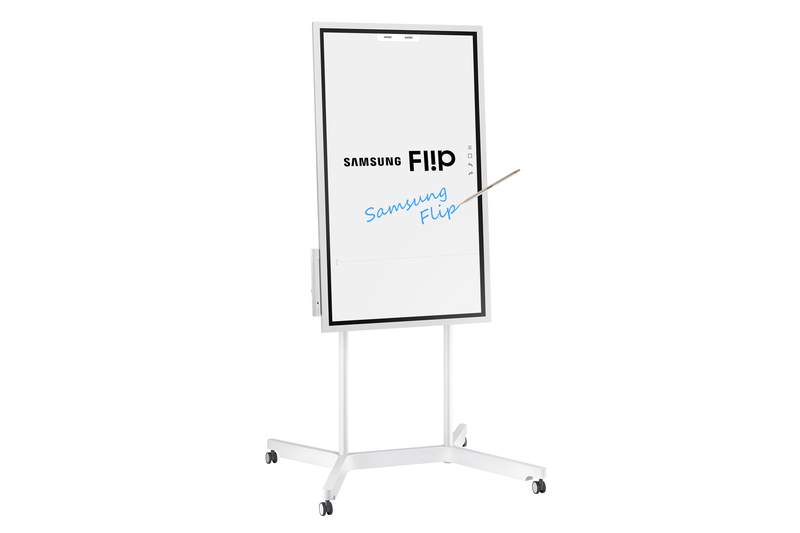 The Samsung Flip is a new digital whiteboard. It’s 55-inches in size and it’s meant for the workplace. 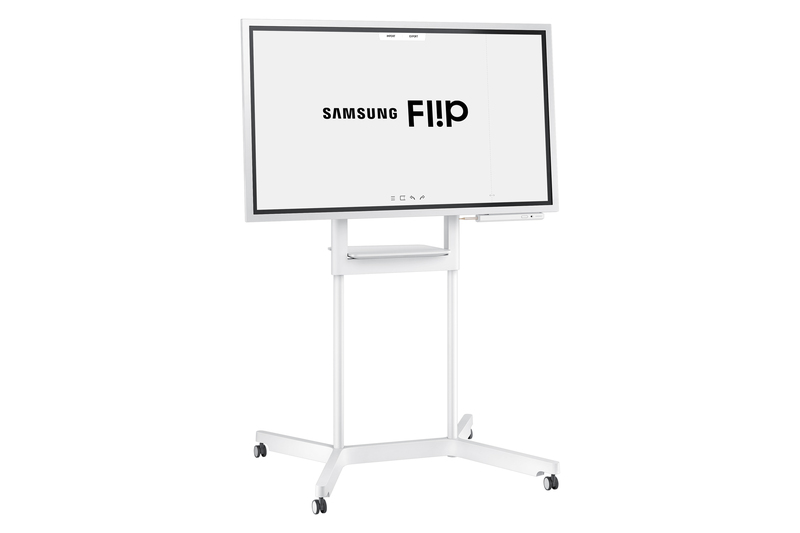 Up to four different participants can add content and annotate directly on the screen at the same time using the embedded pen or their fingers. 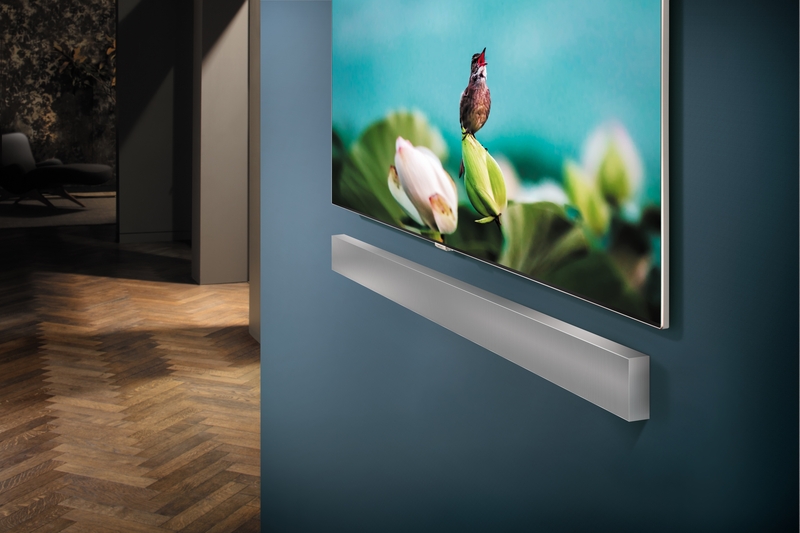 Samsung also announced a new wall-mountable soundbar called the NW700 Sound+. It has distortion-cancelling, wide-ranged tweeters and multi-speaker control. The soundbar has three sound modes, Standard Mode, Surround Mode which can be used to expand surround sound performance and Smart Mode which can automatically adjust volume and surround sound effects.